Dundee Memorial Park Association, Inc.
A park where well-behaved dogs (and owners) can run free, exercise, socialize, make new friends and take a long nap when they get home. 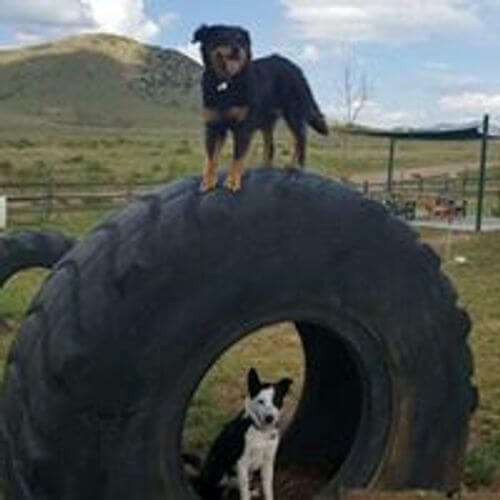 Dundee Memorial Park honors the memory of Dundee, an Australian Shepherd and beloved pet of Dave and Marty Mernitz, who donated land and founded the park in 2013. The three-acre park features two off-leash playgrounds for small and large dogs, gardens, trees, walking paths, superb mountain views, and artwork by local artists. The entire park is fenced with two separate fenced playgrounds for pups to run off-leash with their owners. The playgrounds include double-gated entries, and encompass a natural agility course, a shaded ramada with seating, a dog puddle pool, and a doggie water station. The park provides a venue for local community activities. Most recently, a free concert performed by Silver Cliff Lights, and an outdoor book reading given by an award-winning local children’s author. Dundee Memorial Park is a 501(c)(3) non-profit organization. The park is supported and maintained entirely by private donations, the efforts of dedicated volunteers, and fundraising events including the annual “Birdhouse Bonanza”.